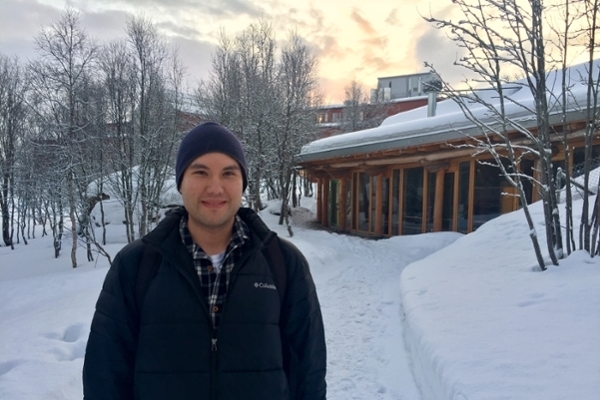 Through an innovative and unique partnership between the Johnson Shoyama Graduate School of Public Policy (JSGS) and the Arctic University of Norway (UiT), Master of Governance and Entrepreneurship in Northern and Indigenous Areas (GENI) student, Blaine Mirasty, was given the opportunity to study at UiT in Tromsø, Norway. Through an innovative and unique partnership between the Johnson Shoyama Graduate School of Public Policy (JSGS) and UiT the Arctic University of Norway (UiT), Master of Governance and Entrepreneurship in Northern and Indigenous Areas (GENI) student, Blaine Mirasty, was given the opportunity to study at UiT in Tromsø, Norway. In December 2017, Mirasty was awarded a GENI scholarship funded by Erasmus+, a European Union mobility program for education, which allowed him to complete four months of study in Northern Norway. With additional funding and support from his First Nation Band, Canoe Lake Cree Nation, Mirasty’s travel and living expenses were covered while he studied thousands of miles from home. While working in the Flying Dust First Nation band office, Mirasty noticed a poster advertising the GENI program. With a little encouragement from his mother, Marcia Mirasty, who is in the JSGS’ Master of Northern Governance and Development (MNGD) program, he enrolled in the GENI program and began in the fall of 2017. In January 2018, Mirasty journeyed to his new home in Kvaløya, which is located 69 degrees North of the Arctic Circle and just outside Tromsø. From there, he would commute to campus to attend his classes. Blaine took five courses while in Norway, including two of his required GENI courses, two-course electives, and a Norwegian language course. One of his courses focused on public policy issues regarding environmental conservation and ecosystem-based management. Another explored economic and ecological characteristics of different types of Indigenous resource management systems. Most remarkably, his Norwegian language class inspired him to someday educate youth back home in his community of Flying Dust First Nation. “I hope to one day provide children in Flying Dust First Nation with traditional teachings of Cree language and possibly land-based education through hunting and fishing trips,” said Mirasty. He also entered the business competition Venture Cup with the University program called Start UiT, a program that initiates business start-ups with university students. In March, Mirasty joined his fellow GENI students in Finnmark, Norway for the field school component of their program. They gained insight into the resiliency of Northern communities from visiting small Northern towns like Kirkenes and Bugøynes. They explored Sami (the Indigenous peoples of Scandinavia) communities like Tana Bru, Neiden, and Karasjok, which introduced them to ideas for regional development in the North. Through king crab fishing excursions, a fascinating visit to the Sami Parliament, touring Sami Museums, and visiting the Centre for Sami Studies at UiT, Mirasty experienced a depth of the Norwegian and Sami cultures. While taking classes, Mirasty joined the local Tromsø hockey team and played with people from Norway, Canada, the United States, Sweden, and Finland. Together, they traveled across the country during the hockey season and ended up finishing second in the league. 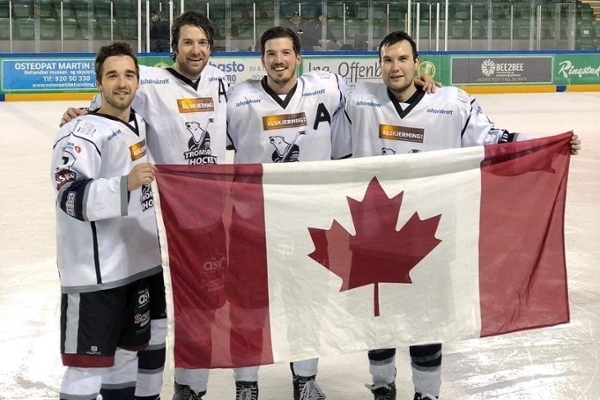 He also traveled to Copenhagen, Denmark to watch Team Canada in the 2018 IIHF World Hockey Championship, stopping to see Malmo, Sweden during his trip. “It was a great experience to play hockey with people from around the world and an incredible opportunity to make friends,” Mirasty said. Mirasty returned from his Norwegian adventure in June and is looking forward to his GENI internship with the Meadow Lake Tribal Council and Canoe Lake Cree Nation, an experience that he will use to guide the research component of his program. Using the lessons he learned in class at UiT and from the field school, Mirasty will explore the establishment of Canoe Lake’s first sports policy through his project, titled: Barriers to the development of a Cohesive Youth Sports Policy in Canoe Lake Cree Nation. Mirasty earned his undergraduate degree in Sociology in 2012, through the Aboriginal Justice and Criminology (ABJAC) program at the University of Saskatchewan. He also completed the Summer Program on Indigenous Peoples’ Rights and Policy at Columbia University’s Center for the Study of Ethnicity and Race, which analyzed Indigenous Affairs and the interaction between the Indigenous movement and the intergovernmental system.